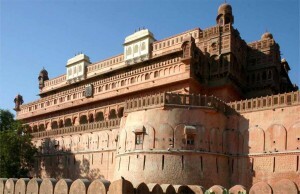 Bikaner was the last destination on our Rajasthan tour, we embarked on recently. Reason being to visit Bikaner was to find solace during vacation, which could be easily found in the desert areas of Rajasthan. 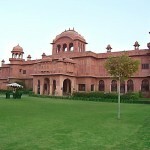 However, forts and other historical monuments of the place could not take a back seat on my Bikaner travel. Two of my colleagues, Richard and Shadrach accompanied me. On moving ahead, we got to know that the fort houses a 986 m long wall along with 37 bastions and two entrances. We entered through the Suraj Pole or Sun Gate. The very sight of the fort transported us to a different world of royalty. The other attractions we came across were Hawa Mahal, Phool Mahal, Ganga Mahal, Badal Mahal and Diwan-e-Khas. Next, we moved on to Lalgarh Palace, an inseparable part of Bikaner Tourism, which was built by Maharaja Ganga Singh in the year 1902. He built the palace in the loving remembrance of his father. On going ahead, we got to know the architecture of the palace. Designed by Sir Switon Jacob, the palace speaks volume about its stunning architecture and intricate craftsmanship. Exquisitely adorned with the latticework and filigree work in sandstones, the palace also conjoins the architectural work of Mughal, Rajput and European styles. How could we skip the famous Karni Mata Temple? It is also known as Rats Temple. Dedicated to Karni Mata who was an incarnation of Durga, the temple lies en route to Bikaner in Deshnoke. The rodents trotting around the premises are the highlights of the temple. 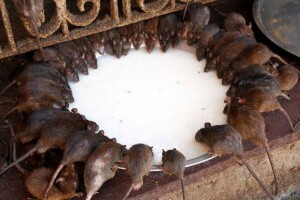 Regarded sacred, these rodents are also fed by the devotees. If they touch the pilgrims, it is considered an auspicious sign. On our Bikaner travel, we were flabbergasted to know that the temple dates back to 600 years. The crowd, trying to feed the rats were enough to make you believe the legends related to that sacred site. We happened to observe the sight of an interesting Camel Breeding Farm at the end of our Bikaner trip. It boasts of being among the largest camel breeding farms in Asia. Lying 8 km from the main city, it is a Government museum, which is sprawled around 2,000 acres of semi arid land. The centre is engaged in breeding and training of camels, which was exciting to see. I had never come across such wonderful sights of camels where they were privileged like humans. Though our Bikaner trip was hectic one yet it left us with a wonderful experience. 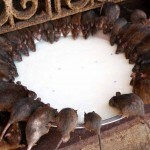 Deshnok Temple – The Kingdom Of Rodents!